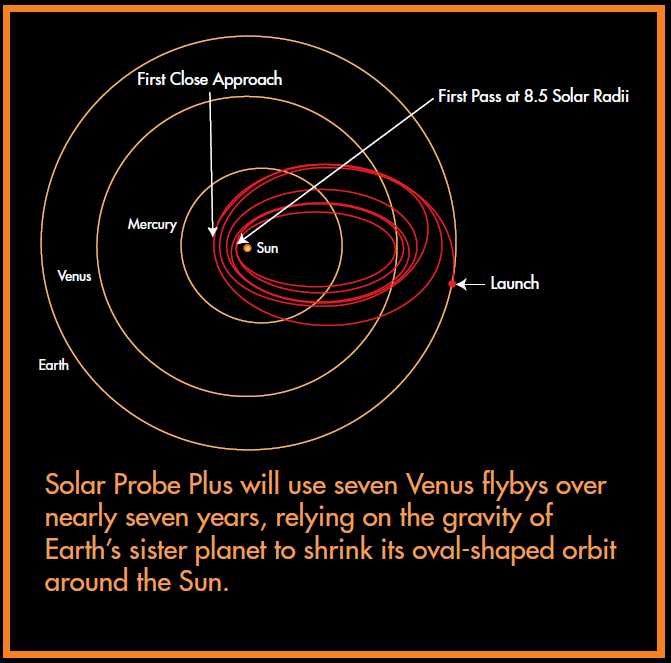 Solar Probe Plus will flyby Venus 7 times(!) during 6 years in order to enter its "low" Solar orbit. Will it carry any instrument useful for studying Venus, for example seasonal changes? Would its trajectory be useful for secondary payload to study Venus during the first flyby? I see that SPP will be launched on a Delta IV Heavy, the most capable rocket in operation today, does that speak for allowing some secondary minisat payload? This was addressed directly by Dr Nicola Fox, project scientist for the Parker Solar Probe mission in an interview during NASA's live broadcast of the August 12th 2018 launch - hence the late answer! Q: Is there an opportunity for Parker Solar Probe to collect any science on its way to Venus and back to the Sun? A: Our intention is to have the instruments on as much as possible, so we will have them on for the full journey in around the Sun and the full journey out. The only time that we will not have the instruments on really is if we're doing a major manoeuvre on the spacecraft or if we're sending our data down when we need all the power to go into the system that is going to transmit the data and so we switch off the instruments during those periods. I often get asked 'Are you going to do science around Venus?' and unfortunately, my quick answer is always no. because when whenever we're flying past Venus that is our prime time to get our coronal science data down, and so the instruments are planned to be off when we do our Venus flybys. There is one later in the mission - we actually do 7 of them - there is one where the instruments can be on and we are excited about what kind of science we'll be able to do then. But that's a number of years away and a few days away from launch everybody's focusing on the launch right now. It wasn’t mentioned what experiments might be run or data collected. However, due to the tight mass constraints, there are no instruments on board that are specifically for Venusian science. As one scientist said to me "It would be a sin to fly by Venus and not do science". So, yes, scientifically valuable data will be collected during the Venus flybys. HOWEVER, designing and building a spacecraft that will fly through the sun's corona 24 times over 7 years is a very complex, very challenging engineering feat. Everything, and I mean every single, minute detail, of the spacecraft design has to be focused specifically and only on the mission's primary science goals. Nothing, and I mean absolutely nothing, other than that can be accommodated. So, useful and interesting data will be collected at Venus, but only what can be incidentally obtained with a spacecraft that is designed specifically and only for the challenge of unlocking the secrets of the Sun's corona. Let's take a look at the instruments, as seen at JHU APL's site. Solar Wind Electrons Alphas and Protons Investigation- Measures solar wind particles. Might do a bit of science at Venus with how the solar wind reacts to Venus. I personally don't know much about the science value of this, but as @gerrit mentioned, it is currently being done by Mars Express. The Wide-field Imager, This will allow for images to be taken. I suspect this will give some science, but not a whole lot, as Venus requires specific cameras to make anything of interest. The Fields Experiment, measuring electric and magnetic fields. I think this has a real chance of making some interesting studies at Venus, to determine more about any magnetic fields it might have. The Integrated Science Investigation of the Sun- This might help to determine things like atmospheric leakage at Venus. Why not have something specific to Venus? Take a look at this image below, copied from the fact sheet. Note that even the first approach will go beyond Mercury towards the Sun. This is with a flyby of Venus, but still, it no doubt needs a significant amount of delta v to achieve this. I suspect there just isn't much room for any mass improvements, even with the large rocket that it will be launched on, much as New Horizons was. Not the answer you're looking for? Browse other questions tagged probe venus payload the-sun parker-solar-probe or ask your own question.